Haley Porter with one of her 19 assists. 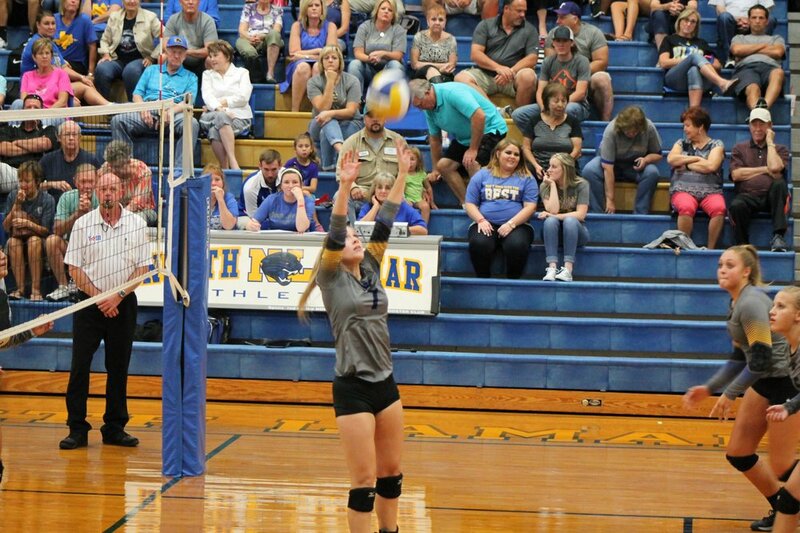 After a second place finish in the Tyler tournament, the North Lamar Pantherettes returned home Tuesday night to face Royce City. The Pantherettes made it look easy too as they defeated the visiting team in three sets: 25-17, 25-7, 25-8. Bailey Foy led the team in kills and blocks with 12 each. Four of her blocks were solo. Jacie McFatridge had nine blocks, with four of them being solo blocks. Natalie Allen led the team with 15/15 from the service line. Haley Porter led the team with 19 assists. The Varsity team will be in action on Friday morning as they play in the White Oak tournament. First game is set for 9:30 against Beckville. The North Lamar JV team also defeated Royce City 25-12, 25-20. Mackenzie Mitchell had seven kills and three blocks. Brooke Collard finished with five kills. Madelyn Clark had eight assists while Keegan Fendley finished with 11 digs. The freshman team won 25-13, 25-14.